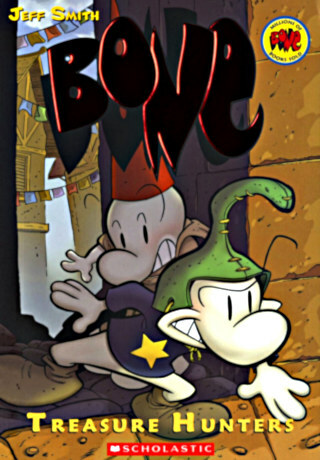 In Bone 8: Treasure Hunters, Gran’ma Ben and Thorn and the Bone cousins (Fone, Phoney, and Smilley) finally arrive at Atheia, the old capital. The city has become the refuge for the surviving people as The Valley is plagued by the Ghost Circles and the Rat Creature armies. At the city, Gran’ma Ben brings Thorn to meet the Teacher, who inform them that a group named the Vedu is now organizing Atheia. From far away, Briar sends her shadow to call Thorn and the Teacher gives a warning that Thorn will be at risk if she falls asleep and dreams. Therefore, she should stay awake. Meanwhile, the real Briar and the Lord of the Locusts is building a plot and gather armies to attack Atheia. The situation is not actually safe for the Bone cousins, Gran’ma Ben, Thorn, and the resistance. Fone Bone has a new enemy, a vicious gigantic male bee who terrorizing the market. Thorn has to hide her true identity and stay away from Briar’s reach through her dream. Meanwhile, the Vedu and the Royal Guard, who believe the Dragons has caused the appearance of the Ghost Circles, are chasing everyone associated with the Dragons. The Bone cousins, Grandma Ben, and Princess Thorn finally reach the city of Atheia, where they reunite with old friends and plan to thwart The Lord of the Locusts. The Pawan army has joined forces with Briar and the rat creatures, and danger increases as Thorn’s visions get stronger. Meanwhile, Phoney Bone is convinced Atheia is a city rich in gold, and he is determined to find it!